backdrop, there is no better place to conduct a picture-perfect wedding. upon to conduct a wedding at the helm. whole vessel or just book a cabin for themselves. smoothly, and add a little fun, as well says Captain Walker. wedding cake baked in a wood-fired oven?” says Captain Walker. or those taking a second chance at marriage. 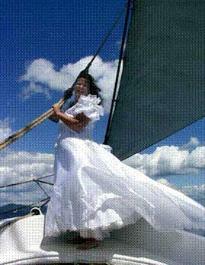 discount to couples sailing on their anniversary date. more information, visit the Maine Windjammer Association. more info visit Maine Adventure Sails.